This web page is part of a series on how local governments and utilities can collaborate to advance energy efficiency. It describes the partnership strategy of implementing efficiency improvements in municipal outdoor lighting, which is the most common type of public outdoor lighting. Public lighting is an essential municipal service. Good quality lighting improves public safety by reducing crime and traffic accidents. Street lighting is often the first or second largest local government energy use, typically accounting for 25–50% of a municipal energy bill. Efficiency improvements to outdoor lighting offer a significant value proposition for both municipalities and electric utilities. Municipalities are able to reduce operating and maintenance costs and improve the delivery of an essential service. Utilities can avoid expensive investments in generation, transmission, or distribution, meet energy savings requirements, and provide a value-added service to improve customer satisfaction. Utilities and local governments have a number of options for working together to reduce these energy costs. Many cities are beginning to take action on improving outdoor lighting; 42% of US cities note that they have used recent federal energy grants for efficient lighting, and 90% of the world’s largest cities report that they have made outdoor lighting improvements. Nevertheless, significant opportunity remains. As an example, as of 2010 only 11% of the lamps for outdoor lighting in the US were high-efficiency LEDs. Lighting technologies have greatly improved over the past decade, making high performance and high efficiency affordable for use at a large scale. High-efficiency technologies—such as LEDs, sensors, monitoring systems, and controls—are beginning to be more broadly adopted for outdoor lighting systems. While these technologies often have higher up-front costs, they offer reduced energy and maintenance costs over time and many additional benefits. LEDs, the most efficient street lighting technology, are coming down in cost quickly, but each lamp fixture typically costs 2–4 times more than traditional high-pressure sodium technology. However it uses 30–50%+ less energy and greatly reduces energy costs over its lifetime. Additionally, because LED lamps last much longer than traditional technologies (typically 7–10 years between replacements, rather than 2-3 years) they also significantly reduce the costs and staff time associated with replacement and maintenance. Several cities have already experienced savings from outdoor lighting programs. New York City is replacing its 250,000 streetlights with high-efficiency LEDs and estimates it will save $6 million in energy costs and $8 million in maintenance costs annually. Manchester, New Hampshire, is installing 9,000 new LED streetlights and is expected to save $500,000 each year in energy and maintenance costs. Additionally, LED lighting investments can provide a variety of co-benefits, including better and more customizable light and increased public safety for both drivers and pedestrians. Installing smart systems with sensors or other technologies that leverage the existing lighting network can also provide data to automatically identify replacement needs, allow for dimming based on natural lighting and nearby activity, and offer additional improvements like grid resiliency, communications networks, and security cameras. The most effective type of partnership or tactic will depend on the current level of support for energy efficiency at the state level and the types of utility programs already offered. Table 1 suggests which of the tactics described in this fact sheet might work best in your city based on the level of support for energy efficiency by the state government and utilities. The tactics should be thought of as options that can build upon one another. The ones in the first two columns will still be effective even in robust energy efficiency states. The fourth column shows strategies that are most effective when they leverage strong utility-led energy efficiency programs. 1. Identify the current ownership and fee structure, stakeholders, savings opportunities, and available financial incentives for the municipality’s outdoor lighting. The first step for any municipality considering improvements to its outdoor lighting is to understand its existing lighting system and to begin engaging with important stakeholders. This includes understanding energy consumption and billing, the inventory of existing lighting assets, ownership and operations responsibilities, and the replacement/maintenance cycle. Engage with the municipal finance department, the electric utility, and other major stakeholders to understand their motivations and incentives for considering outdoor lighting improvements. Municipalities own and maintain all of their streetlights. 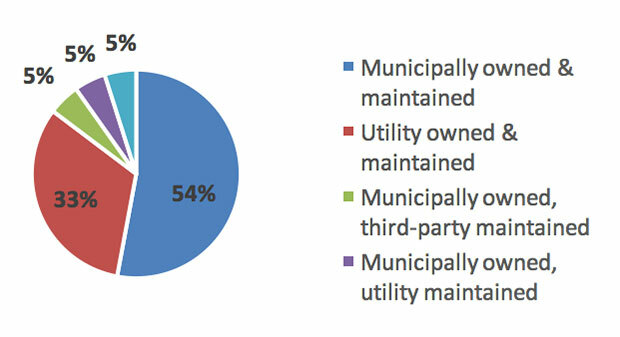 Municipalities own their outdoor lighting, but third parties operate and maintain the system under contract to the municipality. Municipalities own their outdoor lighting, but electric utilities operate and maintain the system under contract to the municipality. Electric utilities own and maintain street lights. California has the best available data for streetlight ownership and maintenance (figure 1). Figure 1. Ownership and maintenance of California’s streetlights. Source: California Lighting Technology Center (University of California, Davis). 2. Coordinate efforts with other municipalities in the same utility service territory. Partnerships with other municipalities in the same region or served by the same electric utility can enable local governments to learn from each other’s experiences, develop shared procurement models that streamline purchasing and bring down costs, and act together to influence state utility policy. Regional working groups, often convened by a council of government or an economic development body, can facilitate peer-to-peer learning and procurement mechanisms, such as volume purchasing alliances that individual municipalities can sign on to. Peer groups of local governments with utility-owned lighting can work with state municipal associations and their utilities to develop fee structures through a rate case or another means that allows for lighting upgrades. 3. Develop a comprehensive improvement strategy and adopt lighting standards for new or replacement fixtures. Municipalities considering lighting upgrades should develop an approach that will upgrade all applicable fixtures. Along with higher cost savings, comprehensive, citywide retrofit approaches generate a desirable return on investment. Additionally, cities can adopt policies—through municipal ordinance, utility policy/agreement, or third-party service contracts—to govern the operation and maintenance of their lighting that include lighting standards for new or replacement fixtures. Model policies such as the Model Lighting Ordinance, product certifications such as ENERGY STAR®, and lifecycle costing in procurement standards can be integrated into municipal policy and practice. Some states have policies or programs that can help local governments adopt these practices. 4. Explore technology and finance options for upgrades through rate tariffs, municipal financing, or energy service contracts. It is important to consider which technologies and financing arrangements will best address the priorities of the municipality. Technology considerations include the fixtures, lamps, and controls to be installed. Even more important is arranging financing and selecting a vendor. Municipalities should consider developing or adapting project specifications before approaching potential vendors. In cities where utilities are closely involved with street lighting, a partnership between the utility and the city is necessary in order to fund (often through adjusted tariffs on utility rates) and undertake a systematic street lighting upgrade. Even when the municipality owns and controls its outdoor lighting assets, electric utilities can be important stakeholders, as they may be able to provide technical assistance and financial incentives for lighting upgrades. Where an energy savings requirement is in place for utilities, they may include programs that support upgrades to public street lighting as a strategy to reach their goals. While some communities that own their lighting may be able to fund upgrades through their existing capital or maintenance budgets or bond financing, most use some combination of third-party finance and grants or rebates from their utility. Most commonly, financing is offered through an energy services company (ESCO) or a product manufacturer. Some states, like Illinois, offer streamlined energy savings performance contracts (ESPCs) for local governments and provide assistance with project development. 5. Include upgrades to public street lighting as a strategy toward reaching energy efficiency targets. Energy efficiency upgrades to public street lighting can be an effective strategy to reduce energy usage and help states, cities, and utilities meet energy efficiency targets. Energy-efficient street lighting uses at least 50% less energy than traditional lighting. Many states have created energy efficiency resource standards (EERS) that establish binding energy savings targets for utilities. Energy-efficient streetlight programs can help meet the established goals. Local government have also begun to create community-wide energy savings targets and are using energy efficiency strategies to meet their goals. Cities that own and maintain their streetlights are creating energy-efficient street lighting programs to help meet their energy-reduction targets, and others are working with utilities to implement these programs. The reduced energy usage that results from upgrading public street lights can thus help states, cities, and utilities meet their targets. While the current state utility policy context is an important factor to consider, local governments and utilities should ask themselves additional questions to determine the most appropriate lighting-related actions. What is the structure of ownership and maintenance of outdoor lighting in your community? When are important contracts up for renewal or revision? What financing mechanisms are available to the community to upgrade your outdoor lighting? How can your procurement and contracting procedures prioritize high-efficiency outdoor lighting improvements and, more generally, the use of lifecycle cost–benefit analysis to maximize the total value of public investments? How can you adjust your rate structures and tariffs to support the adoption of high-efficiency outdoor lighting? How can you provide a rebate or other incentive to your customers for efficient outdoor lighting? What programs or mechanisms could you provide to support the adoption of high-efficiency outdoor lighting at scale across your service territory? In Vermont, municipalities and the statewide energy efficiency program administrator, Efficiency Vermont, work together to encourage the state’s three electric utilities to file rate tariffs to fund the installation of LED streetlights statewide. There is no additional capital expense to the municipalities, as the utilities are able to provide the necessary capital for the new LED fixtures through the tariff. As a result, utility customers (including the municipalities) and Efficiency Vermont benefit from significant cost and energy savings. Efficiency Vermont also is able to credit energy savings from the street lighting efforts toward its annual savings goals as established by the Vermont Public Service Board. Starting in 2009, several municipalities in San Diego County, California, developed a peer-to-peer Streetlight Working Group convened by CleanTECH San Diego, a nonprofit focused on clean economic development for the region. The model proved to be successful for sharing best practices and developing joint processes. This group developed a toolkit for municipalities interested in adopting high-efficiency street lighting, which included shared procurement processes, project specifications, and requests for proposals. This straightforward procurement process allowed municipalities to piggyback on the work of others, especially small, resource-constrained localities that would not have been able to complete the process on their own. As of 2014, 13 cities are upgrading or have completed upgrades to 55,000 street lights, saving an estimated $3 million annually. The city of Asheville, North Carolina, worked with Duke Energy Progress, the owner and operator of its street lights, to establish a new rate structure to allow for the adoption of LED fixtures for all 9,000 lights. Under the old structure the city paid a flat monthly fee for the operation and maintenance of the street lights. Under the new structure, the city now owns the LED fixtures and pays Duke a 50% lower operating fee. In return for the lower fee, the city provided capital raised through a bond issuance to purchase the new fixtures. The city benefits from the lower fee, and the project will achieve one-third of its goal to reduce the city’s greenhouse gas emissions by 20%. The city was also able to use the cost savings to capitalize an internal revolving fund that will be used to pay the upfront cost of future energy saving investments needed to complete the rest of the city’s Green Capital Improvement Plan. Duke Energy Progress, which was facing the need to replace its aging street light infrastructure, secured capital at a lower cost through the city’s ability to borrow at a lower rate. Asheville has since worked with other municipalities in the state and the state municipal association to try to replicate the financing arrangement through utility agreement or state policy. For more information on US cities see: http://usmayors.org/pressreleases/uploads/2014/0227-report-eecbgsurvey.pdf . For more information on international cities see: http://issuu.com/c40cities/docs/c40_climate_action_in_megacities. A street lighting system refers to lamps (e.g., LEDs, high-pressure sodium, etc.) as well as the system that controls and manages the lighting. Sensors are commonly used in automated systems that activate based on the intensity of light and the presence of pedestrians or vehicles. When light is not needed the system will go into a power-down mode. An automated system can also allow for the monitoring of each lamp, providing information on whether they are working properly or how much power is being consumed by each lamp. Smaller LED projects can also generate high savings. The University of California, Davis, conducted a campus-wide lighting retrofit. The project reduced outdoor lighting energy use by an average of 86%, and is expected to save $444,000 in maintenance costs and nearly $1.4 million in energy costs over 15 years. For more information on this program see: http://cltc.ucdavis.edu/publication/campus-wide-networked-adaptive-led-lighting-uc-davis . For more information on New York City’s Sustainable Streets plan see: http://www.nyc.gov/html/dot/html/about/stratplan.shtml. For more information on Manchester’s streetlight project see: http://www.smartgridnews.com/story/all-eyes-first-its-kind-eversource-streetlight-project/2015-07-09?utm_medium=nl&utm_source=internal . For more information on the Model Lighting Ordinance see:http://darksky.org/our-work/public-policy/mlo. For more information on ENERGY STAR see: http://www.energystar.gov/index.cfm?c=lighting.pr_what_are. The DOE Municipal Solid State Lighting Consortium provides a variety of technical resources and assessment tools related to the adoption of LED lighting: http://www1.eere.energy.gov/buildings/ssl/consortium.html. The International Dark-Sky Association provides resources related to outdoor lighting policies, including model ordinances and examples of state and local policies: http://www.darksky.org/outdoorlighting-29. High Performance Outdoor Lighting Accelerator is a collaboration between local governments and the US DOE to rapidly advance the installation of improved outdoor lighting:http://www1.eere.energy.gov/buildings/betterbuildings/accelerators/outdoor.html.